Looking back at the year that was, Fundraising asked top bloggers in the sector to describe their favourite campaigns of 2013. Craig Linton selected Friends of the Earth's Bee Cause. There is a lot to admire about Friends of the Earth’s Bee Cause campaign and it is my favourite fundraising campaign of 2013. ‘Save Britain’s bees’ is a call to action simple to understand. It’s an attention-grabbing fundraising proposition that will have introduced Friends of the Earth to audiences beyond its typical supporter base. There’s a clear offer that works across multiple channels, target audiences and price points. 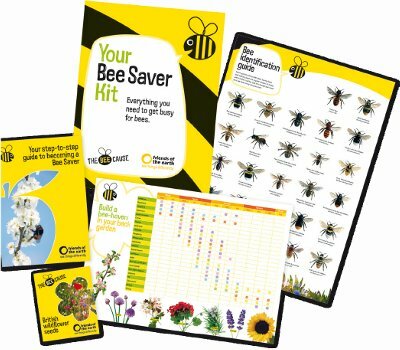 From texting in to get a Bee Saver kit to a high-value direct mail pack which asks for £1,000 to help set up a Bee World, there’s something for everyone to give to. It’s integrated across fundraising and campaigning. You can sign a petition to send to the Bees Minister and Friends of the Earth have hosted a ‘Bee tea’ at Westminster that attracted a record attendance from MPs for a Friends of the Earth event. The bright yellow and black design gives the campaign a distinct look and stands out from other more mundane creative. When combined with the strong offer, it is a winning combination. Most importantly it smashed its fundraising target, recruited record numbers of new donors for Friends of the Earth and engaged its current supporters too. It raised more than £350,000 and recruited 4,000 donors. Joe Jenkins, director of fundraising, communications and activism, told me that the charity decided to launch an organisational campaign that had the capacity to achieve real change, while also maximising engagement which involved recruiting activists, raising money and inspiring local Friends of the Earth groups. “It also coincided with a major refresh of our brand and investment into our fundraising programme. The campaign has been pulled together by a cross-organisational team that ‘co-creates’ the political strategy, media strategy, creative, activism and fundraising strategies,” he says. So, in my opinion, the campaign was the bee’s knees and created lots of buzz with little sting in the tail and un-beelievable results. What’s not to like?